Bobby Colter is a criminal defense lawyer who can usually be found defending some of the slimier denizens of the criminal world. He’s good at what he does. 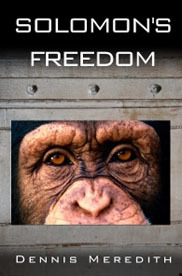 Sarah Huntington is the wealthy woman who hires Colter to save a chimpanzee’s life. The ape has been purchased by a media scion in ill health who plans to use the chimp’s heart to help his own. I’m grossly simplifying this in the quest for brevity of this review. It would be completely unfair to the author to characterize Solomon’s Freedom as “courtroom drama” or an “animal rights” plea. It is both, yet neither. It is first and foremost an action-packed thriller that I accidentally started at midnight and had to read completely through to the ending, somewhere around 4:30 AM. It is entertaining and wonderfully written. Along the way, all of the arguments in favor of, as well as against giving a chimpanzee any special rights is included in the dialogue. Meredith’s skill as an author is that he doesn’t let that get in the way of his story. Now this is important: If this were a non-fiction book, I — as a reviewer and you as a reader — could debate the arguments about animal rights. Solomon’s Freedom is a work of fiction and I don’t debate those sorts of things in a work of fiction any more than I would the theory behind a science-fiction author’s use of “warp drives” to propel a star ship around the cosmos. There IS some scientific theory in the book. Some of it is real and some is not. That you would be hard-pressed to tell where one ends and the other begins is a tribute to the author. In my review of his previous sci-fi novel, Wormholes: A Novel, I said that Dennis Meredith, “…reminds me a lot of the work of Michael Crichton in that the science in the story is close enough to existing theory to make the reader a believer that this could all happen. It’s also kept enough in check as to not slow down the story.” The same is true with Solomon’s Freedom. Here’s something else that I love about this book: Plot complications galore! They just keep piling up; one after another. Bobby Colter seems to have everything going against him. That’s great writing and it is exactly what makes for a terrific thriller. Lastly, the characters. They are quirky and wonderful. You get to know them fully through the author’s skillful prose and almost all of them (even the bad guys!) are likable. By the way, so is Solomon. Solomon’s Freedom is a grand slam thriller and is the best book I’ve read in quite a while. Enjoy! Really appreciate your book reviews, every book that you recommend seems to be one I like! Thanks! I appreciate your compliment!